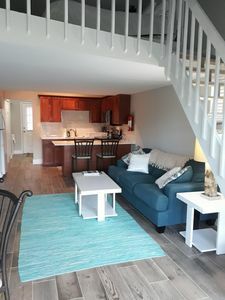 Welcome to our recently renovated (2018) and completely updated large two-bedroom, ground floor, oceanfront condo at Kaibo. 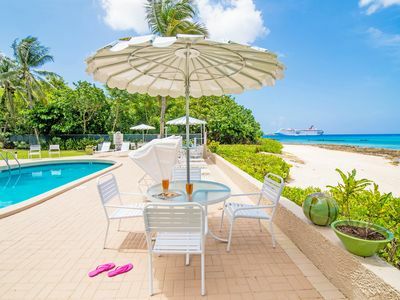 This small, private 30-unit complex is located away from the cruise ship congestion of Georgetown and the crowds at Seven Mile Beach yet with all the amenities and conveniences you require for a great vacation. 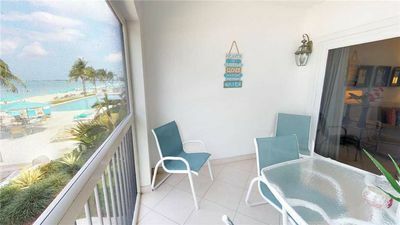 Our ground floor unit allows you to step from our screened in lanai onto the pristine white sandy beach and walk a few steps to the ocean or a few steps to the infinity edge pool and jacuzzi. The convenience of ground floor units at Kaibo are in high demand versus second floor units that require you to go up and down flights of stairs and walk around the complex to get to the pool and the beach. 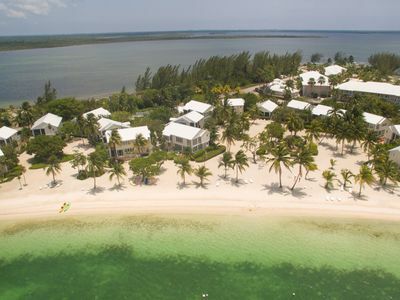 Our condo is in phase two of the Kaibo Yacht Club development which provides you with amenities similar to that of a major hotel within the quiet peaceful setting of Kaibo. 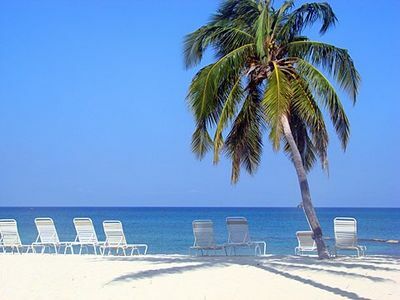 You can walk a few steps from our condo to the Kaibo Bar and Grill with casual dining on the beach and a Tuesday evening barbecue that is a favourite destination for tourists and locals alike. Upstairs at Kaibo is one of the top rated restaurants in Grand Cayman. Kaibo even has a coffee shop for early morning breakfast. The docks at the Kaibo Yacht Club are a pick-up and drop-off point for tour companies so you have the convenience of simply walking to the dock to board your tour boat for Sting Ray City tours (a must do experience where you can swim with and feed the gentle southern stingray), snorkeling and diving tours or private fishing charters. 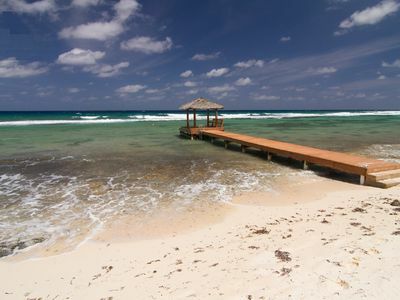 There is even a water taxi service at the dock that will take you to Camana Bay for upscale shopping or to enjoy a day at Seven Mile Beach without having to drive. 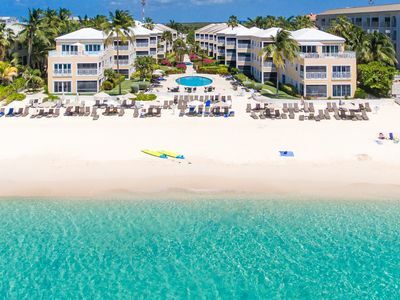 Red Sail Sports is also located on the beach at Kaibo so you can conveniently rent jet skis, kayaks, paddle boards or book snorkelling, SCUBA and diving trips. Our 1200 sq. ft. two bedroom two bathroom condo comes with a sofa bed in the living room allowing for a total of 6 guests. The condo has new furnishings throughout. The master bedroom has a king sized bed, make-up table, flat screen TV with cable service, full ensuite bathroom and a walk-in closet. 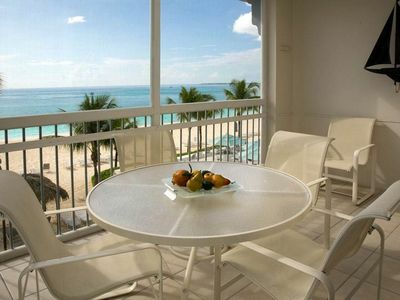 Open the California shutters to an incredible view of the beach, the palm trees and the ocean. The second bedroom has two twin beds and a flat screen TV with an X-Box 360 connected with an assortment of family friendly games and the ability to view DVD movies. The living room has a large sofa with a queen sized pull out bed, a flat screen TV with cable service and DVD player. 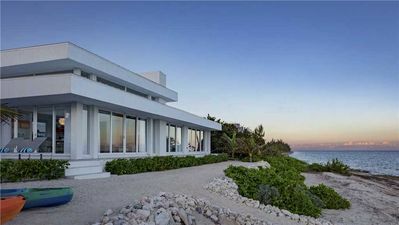 There are sliding glass doors from the living room to the screened Lanai providing fabulous views of the beach, the ocean, the pool and the boats at the Kaibo Yacht Club. The lunai has soft seating for relaxing and enjoying the views and is equipped with shade and privacy screens. 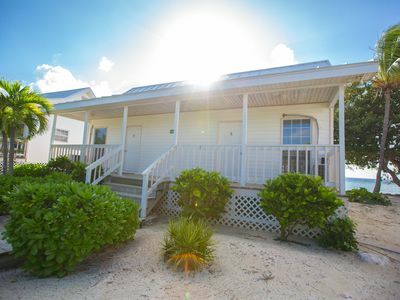 The kitchen is fully equipped with all you would expect including dishes, glasses, plastic cups for the pool, utensils, Kuerig coffee maker, dish washer, stove, fridge and microwave. The kitchen has a breakfast bar with four stools and a round table that will seat six. The condo is equipped with a new high end washer and dryer for your convenience. We also have a charcoal barbecue outside of the Lanai for your use. To keep you connected to the outside world we have high speed internet with a wireless router. 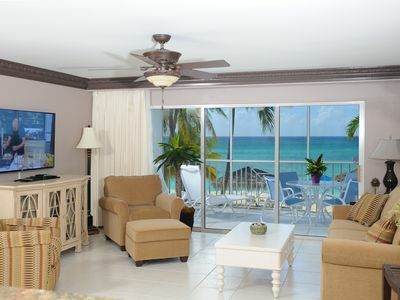 Our condo is the perfect location for a romantic getaway or a family vacation. 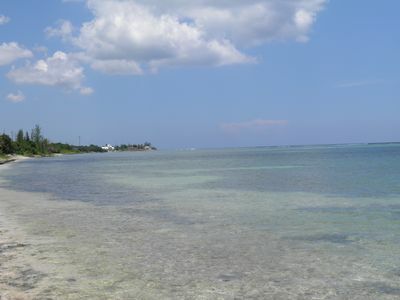 In addition to all the conveniences of being beside the Kaibo Yacht Club from our condo you can walk ten minutes to Starfish Point, a shallow sandy beach where you can walk out into the ocean and touch star fish (we suggest you go early in the day to avoid the tour boats as this is a favourite tour boat destination). 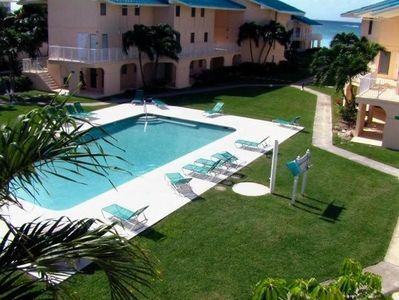 Rum Point is another beautiful beach about 5 minutes by bike or 2 minutes by car with a nice swimming area, gift shop, casual restaurant and bar and an upscale restaurant for evening dining. The snorkelling right off the beach at Rum Point is spectacular. 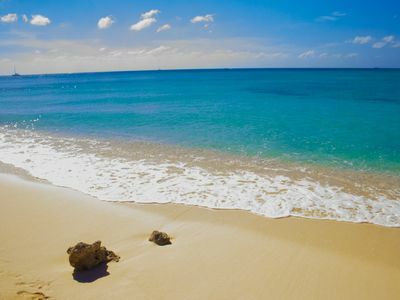 Other island activities include horseback riding on the beach, swimming with the dolphins and the turtle farm. For golfers there is a championship 18 hole golf course on the island. There are four bikes to use free of charge, 2 adult, 2 kids bikes. We have many board games, cards, poker chips, DVD's, books, a CD stereo, beach toys, snorkel gear, kids swim goggles and fins. Eating choices are plenty and range from buying your own groceries and taking advantage of our fully equipped kitchen and outside barbecue, to finding inexpensive out of the way eateries visited by the locals, to the convenience of the Kaibo beach bar and grill with its outside pizza oven located right next to the condo. In addition there are several great restaurants within a 20 minute drive. For upscale dining, Kaibo Upstairs has been rated the best restaurant in Grand Cayman from 2012-2016 and it is all of a one-minute walk from the condo. They also have the most unique and fully equipped rum bar in the Caribbean. Our property manager Barbara will make sure that the condo has some basic condiments for your convenience. Barbara has been providing her services to guests of homeowners in the Kaibo area for over 30 years and you will be well served by her experience and knowledge of the area and you will be well looked after if any problems or issues arise. We are new owners and this is a new listing so we may not have as many reviews as other condo’s. 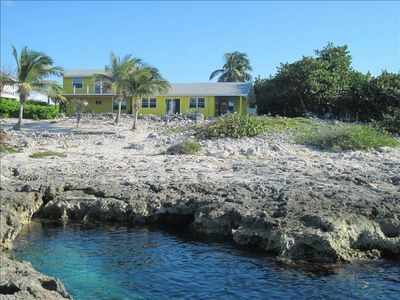 However, we have visited the island for many years and after much research we found the very best location on the island for our "shack on the beach". 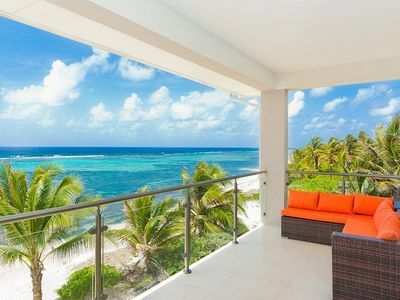 Until such time that we are ready to semi-retire we are pleased to offer our condo for rent to those who will treat it as their own luxury getaway. You will not be disappointed if you book with us. 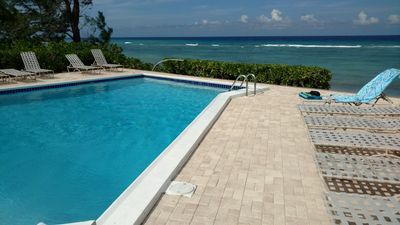 Discovery Point Club #6 Ground Floor Sleeps 6 Seven Mile Beach at it's finest! 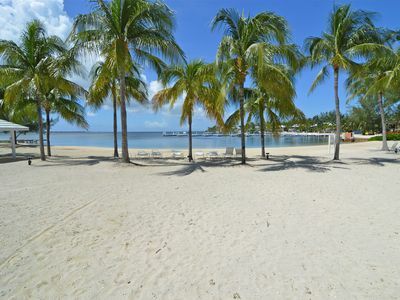 Check Out Our Gorgeous, Private White Sandy Beach ! 3, 4 or 5 Bedrooms!